You know it’s winter when your windows fog up. Not only is this one of the most annoying features of the season, it’s also extremely dangerous if you don’t take it seriously. Hopefully you’ve never experienced the panic of being on an busy road when your car windows start to fog up. Add some ice and/or snow to the mix, and you have a recipe for a wintertime disaster. Thankfully, there is an easy fix to eliminate foggy windows for good. All you need is a sock and some kitty litter. That’s right, cat litter has many other uses besides just absorbing your favorite cat’s unmentionables. Cat litter is scientifically designed to absorb moisture in the air around it. So, if you place a sock with cat litter in your car, there will be less water molecules flying around in the air. Less water molecules means a reduced chance for these molecules to condense and blur up your windows. Our car windows fog up on the inside during the winter because the inside temperature is so much higher than the outside temperature. This makes the water molecules inside the car condense and form on the car’s windows. Most people recommend using crystal cat litter for this trick. That’s only because crystal cat litter tends to be less stinky than other brands. However, any cat litter you can tolerate the smell of is good enough. Just fill a sock with the cat litter, tape it up with masking tape, and place it in your car. It’s really that simple. 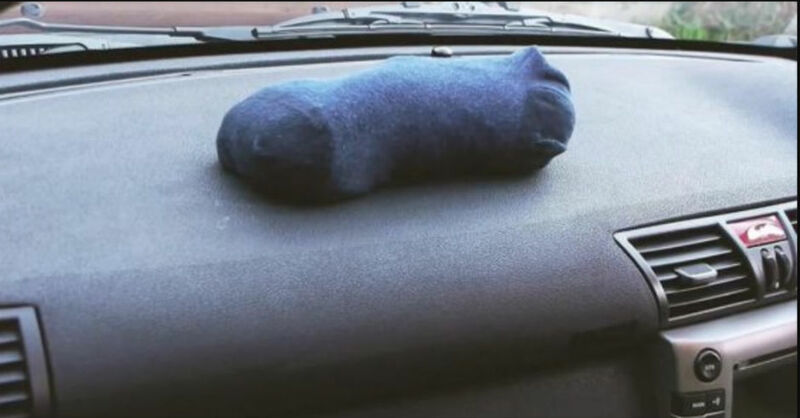 Leave the sock on the dashboard by the front window overnight, and you should walk into your car in the morning with absolutely no fog on the inside. There are a few other tips that also work for this foggy problem if you don’t like the cat litter trick. One other tip involves using shaving cream. Just spray a bit of shaving cream on a towel and wipe it all over the foggy window. After you’ve spread the cream all around, then wipe it off thoroughly with a dry towel. You should immediately see results. The last tip involves defogging the mirror using your car’s AC. Be sure your heat is on full blast and that you are shooting the air at your front window. Also ensure your AC is on. This is the textbook “correct” way to defog a window, but it could take longer than the other two methods. Whatever method you use for defogging your windows, it is important to always ensure your windows are totally clear before driving. Also, be sure your mirrors are all in the correct positions and that you can see clearly through every single one of them. Safe driving habits are so critical to practice during winter.